Hi all! It’s been surprisingly warm around these parts. And let me tell you, I am all smiles about that. Before my boyfriend and I took these photos he looked down before I put on my shoes and said, “I forgot you had feet…” I think I might forgotten have too. It’s been boots, boot and more boots for the last few months. Oh, and my hideous house slippers. So I decided to resist tights for this outfit. Although, they were hot pink and I am definitely going to put them in another post—because hot pink is rad! 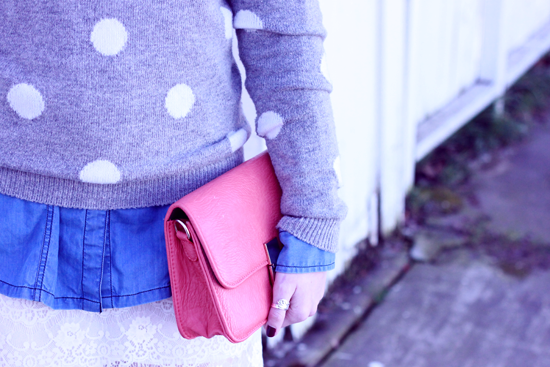 But with polka dots, chambray and lace there is quite enough going on here with out them. How do you choose what to eliminate when an outfit becomes too busy? Leave a comment below! the title of this post is amazing!!! the look is even better 🙂 all the neutrals paired together & the pop of you maroon mary-janes. so cute!! Your layers look sooo good, and I’m loving those shoes! 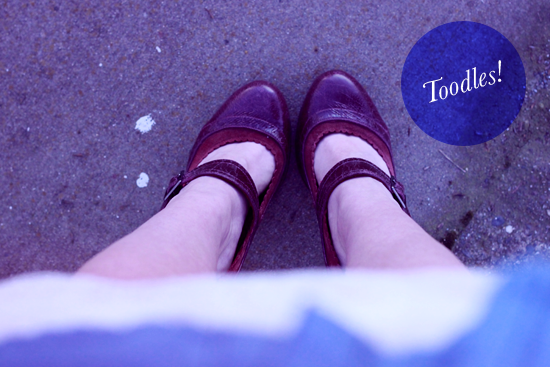 LOVE those shoes and the fact that you thrifted them is even more awesome! This whole outfit us just grand! This morning I looked at myself before heading out the door and took off my big earrings. They were just too much with a patterned blouse, scarf, coat, and bow in my hair!